"An Instagram model is facing an angry backlash from hundreds of men after hosting a 'Tinder Live' event where they competed to date her. 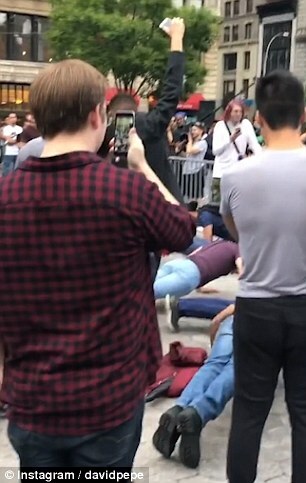 Natasha Aponte, who describes herself online as an 'actress, model and singer', invited the men for what they thought would be a one-on-one date in Union Square, New York. But when they arrived she announced they would have to take part in challenges including push-up contests and sprints in order to land the date. The scam was revealed by Twitter user Misha, who was one of the men tricked into attending the event. Misha said the scam began when he matched with Natasha on Tinder a few weeks ago and the pair got chatting. They swapped numbers and moved to texting before Natasha made some excuse about being busy with work and asked to get back to Misha in a couple of weeks. 'I thought: "Well that's an overly elaborate way to ghost someone",' he said. When Natasha actually got back to him a few weeks later and arranged to meet him in Union Square he was surprised but grateful. She told him that a DJ friend of hers would be playing and to meet her in front of the stage. When Misha turned up, there was a stage with music playing and between 100 and 150 people standing in front of it. 'I wasn't gonna stand in front of the f***ing stage so I stand off to the side a bit,' he said. 'Eventually I see a girl moving towards backstage with two enormous bodyguards in sunglasses and realise it's her and I'm thinking WHAT THINE F***ETH IS GOING ON. 'She gets the mic and is like thanks for coming out I bet you're all wondering what this is about and I'm like yeah what the f*** is this about. 'Then she says: "I've invited you all here for a chance to go on a date with me" and proceeds to give a hunger games speech about what its gonna take to date her. 'All the dudes three she found on Tinder and texted them the same s***. 'At that point I am genuinely amazed at the fallopian fortitude this girl possesses. This is top 10 greatest finesse of all time. Dudes actually stayed and played. 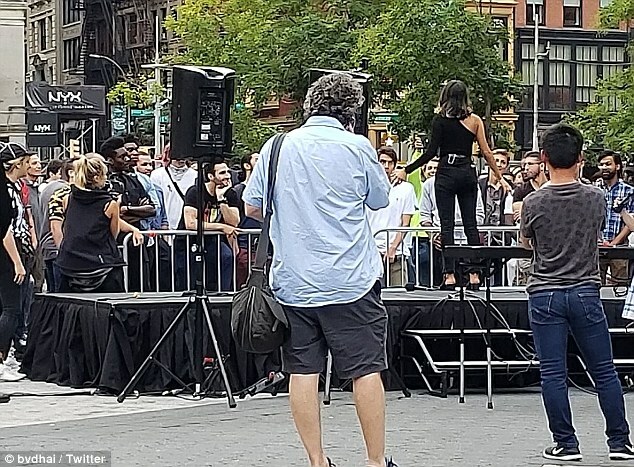 Videos of the event show some men cursing at Natasha as she speaks on stage - with one shouting 'bulls***' - others reveal that at least some of them stayed around to try and win the date. Natasha reportedly started with some questions - asking all Trump supporters and those under 5ft 10ins to leave, along with bearded men, all men who had been dumped by their last girlfriend, and those called 'Jimmy'. The remaining men competed in sprints and push-up contests for a chance to go out on a date with her. She then did a 'live swipe' in which she asked the men to line up before 'swiping' left or right to reject them, as you would do on Tinder. All the time Natasha was surrounded by two female referees who helped police the contests and two large bodyguards. Spencer M., a 22-year-old social media intern, told Gothamist that men who were duped by Natasha have now begun contacting each other. 'It's like a support group now,' he said, before adding: 'It's an amazing story and as far as scams go, it wasn't that bad. It is not clear if any man was actually chosen for the date." Вот только где вы себе дам собираетесь искать для создания семей и рождения детей??? На что вы, русачки, расчитываете?? ?